Help the Free French? Not world-weary gunrunner Harry Morgan (Humphrey Bogart). But he changes his mind when a sultry siren-in-distress named Marie asks, “Anybody got a match?” That red-hot match is Bogart and 19-year-old first-time film actress Lauren Bacall. Full of intrigue and racy banter (including Bacall’s legendary whistling instructions), this thriller excites further interest for what it has and has not. Cannily directed by Howard Hawks and smartly written by William Faulkner and Jules Furthman, it doesn’t have much similarity to the Ernest Hemingway novel that inspired it. And it strongly resembles Casablanca: French resistance fighters, a piano-playing bluesman (Hoagy Carmichael) and a Martinique bar much like Rick’s Cafe Americaine. But first and foremost, it showcases Bogart and Bacall, carrying on with a passion that smolders from the tips of their cigarettes clear through to their souls. Marie ‘Slim’ Browning (Lauren Bacall): Who was the girl, Steve? Harry ‘Steve’ Morgan (Humphrey Bogart): Who was what girl? Marie ‘Slim’ Browning (Lauren Bacall): The one who left you with such a high opinion of women. Marie ‘Slim’ Browning (Lauren Bacall): You know Steve, you’re not very hard to figure, only at times. Sometimes I know exactly what you’re going to say. Most of the time. The other times… the other times, you’re just a stinker. Harry ‘Steve’ Morgan (Humphrey Bogart): What did you do that for? Marie ‘Slim’ Browning (Lauren Bacall): I’ve been wondering if I’d like it. Harry ‘Steve’ Morgan (Humphrey Bogart): What’s the decision? Marie ‘Slim’ Browning (Lauren Bacall): I don’t know yet. Marie ‘Slim’ Browning (Lauren Bacall): It’s even better when you help. Eddie (Walter Brennan): Was you ever bit by a dead bee? Marie ‘Slim’ Browning (Lauren Bacall): I’m hard to get, Steve. All you have to do is ask me. Harry ‘Steve’ Morgan (Humphrey Bogart): You know what you’re getting into. It’s gonna be rough. Marie ‘Slim’ Browning (Lauren Bacall): You know you don’t have to act with me, Steve. You don’t have to say anything, and you don’t have to do anything. Not a thing. Oh, maybe just whistle. You know how to whistle, don’t you, Steve? You just put your lips together and… blow. Marie ‘Slim’ Browning (Lauren Bacall): Give her my love. Harry ‘Steve’ Morgan (Humphrey Bogart): I’d give her my own if she had that on! Eddie (Walter Brennan): Drinking don’t bother my memory. If it did I wouldn’t drink. I couldn’t. You see, I’d forget how good it was, then where’d I be? Start drinkin’ water, again. Harry ‘Steve’ Morgan (Humphrey Bogart): Anybody got a match? Marie ‘Slim’ Browning (Lauren Bacall): Change your mind? Harry ‘Steve’ Morgan (Humphrey Bogart): No money, those guys cleaned me out. Marie ‘Slim’ Browning (Lauren Bacall): I forgot too – maybe I can do something, its been a long day and I’m thirsty. Harry ‘Steve’ Morgan (Humphrey Bogart): Picked him out yet? Marie ‘Slim’ Browning (Lauren Bacall): You don’t mind do you? Harry ‘Steve’ Morgan (Humphrey Bogart): You’re thirsty, go ahead. If I get tired of waiting, I’ll be back at that hotel. Marie ‘Slim’ Browning (Lauren Bacall): What are you trying to do, guess her weight? Harry ‘Steve’ Morgan (Humphrey Bogart): She’s heftier that you think. Harry ‘Steve’ Morgan (Humphrey Bogart): Better loosen her clothes. Marie ‘Slim’ Browning (Lauren Bacall): You’ve been doing all right. Marie ‘Slim’ Browning (Lauren Bacall): Maybe you’d better look after her husband. Harry ‘Steve’ Morgan (Humphrey Bogart): He’s not going to run out on me. Marie ‘Slim’ Browning (Lauren Bacall): Neither is she. Title Card: Martinique, in the summer of 1940, shortly after the fall of France. Harry ‘Steve’ Morgan (Humphrey Bogart): Morning. Officer at port: Good Morning, Captain Morgan. What can I do for you today? Harry ‘Steve’ Morgan (Humphrey Bogart): Same thing as yesterday. Officer at port: You and your client wish to make a temporary exit from the port? Harry ‘Steve’ Morgan (Humphrey Bogart): *That* is right. Harry ‘Steve’ Morgan (Humphrey Bogart): Ha – Harry Morgan. Harry ‘Steve’ Morgan (Humphrey Bogart): Eskimo. Harry ‘Steve’ Morgan (Humphrey Bogart): American. Marie ‘Slim’ Browning (Lauren Bacall): Cricket. I came to say good-bye. Marie ‘Slim’ Browning (Lauren Bacall): We’re leaving now. Thanks for everything. Cricket: Hey Slim, are you still happy? Marie ‘Slim’ Browning (Lauren Bacall): What do you think? Eddie (Walter Brennan): I’ve been figuring, them guys don’t think that I’m wise, but they was trying to get me drunk. Eddie (Walter Brennan): They don’t know me, do they, Harry? Humphrey Bogart and Lauren Bacall fell in love during production. Director Howard Hawks afterward said that it was actually Bacall’s character Marie that Bogart had fallen for, “so she had to keep playing it the rest of her life.” However, it has also been said that Hawks – who was something of a womanizer, and who had a fling with Dolores Moran during the shooting of the film – was jealous and frustrated that Bacall had fallen for Bogart and not for Hawks himself. The film debut of Lauren Bacall. The DVD sleeve notes state that she was nineteen years of age at the time whilst her dialogue in the film indicates that she was playing a character (Marie ‘Slim’ Browning) which was aged twenty-two years of age. Ernest Hemingway had bet Howard Hawks that Hawks couldn’t film this novel. Hawks did it by deleting most of the story, including the class references that would justify the title, and shifting to an earlier point in the lives of the lead characters. The setting was shifted to Martinique because the Office of Inter-American Affairs would not have allowed export of a film showing smuggling and insurrection in Cuba. The only film to date (2000) based on a novel by a Nobel Prize-winning author (Ernest Hemingway) to have its screenplay co-written by another Nobel Prize-winning author (William Faulkner). The most famous scene in To Have and Have Not (1944) is undoubtedly the “you know how to whistle” dialog sequence. It was not written by Ernest Hemingway, Jules Furthman or William Faulkner, but by Howard Hawks. Hawks wrote the scene as a screen test for Bacall, with no real intention that it would necessarily end up in the film. The test was shot with Warner Bros. contract player John Ridgely acting opposite Bacall. The Warners staff, of course, agreed to star Bacall in the film based on the test, and Hawks thought the scene was so strong he asked Faulkner to work it into one of his later drafts of the shooting script. The screenplay was rewritten to boost Slim’s role to take advantage of the public interest in the real life romance between Lauren Bacall and Humphrey Bogart. The movie’s line “You know how to whistle, don’t you, Steve? You just put your lips together and blow.” was voted as the #34 movie quote by the American Film Institute (out of 100). The movie’s line “You know how to whistle, don’t you, Steve? You just put your lips together and blow.” was voted as the #77 of “The 100 Greatest Movie Lines” by Premiere in 2007. Although the source novel and the script were written by 2 Nobel Prize winners (Ernest Hemingway and William Faulkner), most of the dialog was actually improvised by the cast. Hoagy Carmichael played most of his scenes with a matchstick in his teeth. Seeing this on the set at the start of shooting, Humphrey Bogart gave kudos to Carmichael, telling him that the matchstick was a nice touch and would make him stand out in the film. Carmichael was surprised afterward to see a scene being filmed with Bogart and Walter Brennan, both of them chewing matchsticks throughout the shot. They finally revealed that they were having a bit of fun at Hoagy’s expense. Dolores Moran was originally scripted to be the lead actress and Humphrey Bogart’s romantic interest, but her role was shrunk to make room for Lauren Bacall. Howard Hawks gave John Huston the climax (a shootout on a boat) that he was unable to fit into the end of this film. Huston used this in Key Largo (1948) as he had been having difficulties coming up with a satisfactory ending. At the funeral for her husband, Humphrey Bogart, Lauren Bacall put a whistle in his coffin. It was a reference to the famous line she says to him in their first film together To Have and Have Not (1944): “You know how to whistle, don’t you? You just put your lips together and blow.”. When Howard Hawks discovered Lauren Bacall, he gave her the choice to work with either Cary Grant or Humphrey Bogart. 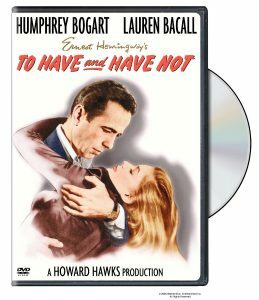 She was very tempted to work with Grant, but Hawks ended up casting her with Bogart in To Have and Have Not (1944), and one of Hollywood’s greatest romances was started. The first of four films made by real life couple and later husband and wife Humphrey Bogart and Lauren Bacall. Many of aspects of Lauren Bacall’s screen persona in her film debut To Have and Have Not (1944) were based on director Howard Hawks’ wife at that time, Slim, including her name, glamorous dresses, long blonde hair, smoky voice and demure, mysterious demeanor. Feature film debut of Hoagy Carmichael. Andy Williams states in his biography that his voice (at age 14) is the one actually used for Lauren Bacall singing “How Little We Know”. But according to author Eric Lax, Bacall did her own singing, after researching studio call sheets. “Lux Radio Theater” broadcast a 60-minute radio adaptation of the movie on October 14, 1946 with Humphrey Bogart and Lauren Bacall reprising their film roles. A stevedore is a dock worker and is generally accepted as the reason the nickname Steve was selected for Humphrey Bogart’s character.